Coffee had been popular in Boston for over a century, when the Revolutionary women of the town became patriotically incensed. Many women owned coffee houses, which traditionally had been frequented by men. Dorothy Jones had been issued a license to sell coffee in Boston in 1670.“Mrs. Dorothy Jones, the wife of Mr. Morgan Jones, is approved of to keepe a house of publique Entertainment for the selling of Coffee & Chochaletto." The last renewal of Mrs. Jones's license was in April 1674, at which time she was accorded the additional privilege of selling"cider & wine." Her husband Morgan Jones was a minister & schoolmaster who moved from colony to colony frequently, leaving Dorothy Jones to make her own way financially for herself and their family. 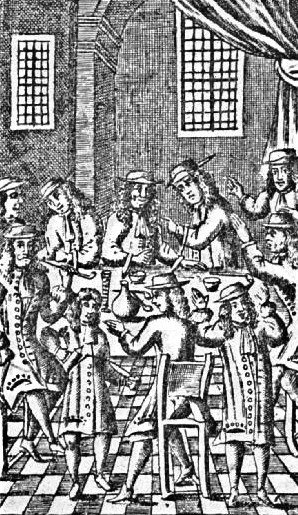 After the Welsh gentlewoman Dorothy Jones opened her 1670 Boston coffee & chocolate establishment, the next colonial coffee house may have been in Maryland. In St. Mary's City, Maryland, the 1698 will of Garrett Van Sweringen, bequeaths to his son, Joseph, "ye Council Rooms and Coffee House and land thereto belonging," which Van Sweringen had opened in 1677. Approved by the town-fathers of Boston,“Jane Barnard approved to keepe a house of publique Entertainment for the sellinge of Coffee and Chucalettoe” Chocolate! Chocolate was first brought to Charles V in Spain by Cortez in 1524, and its use as a hot drink spread.While Jane Barnard did have a tavern license already, she was only allowed to sell coffee and cider. She saw a future in chocolate in North America just like Dorothy Jones saw a future in coffee. It was a leap, but they were both right. Chocolate and coffee were both introduced to colonial British America at just about the same time. There was a Boxton goldsmith, John Hull who was selling chocolate in 1667, but it hadn’t really caught on. While coffee was relatively novel and unknown in 1670’s colonial British America, some colonists did know its popularity elsewhere. England had taken to coffee almost 20 years prior. As coffee became popular in Europe, these women saw potential. 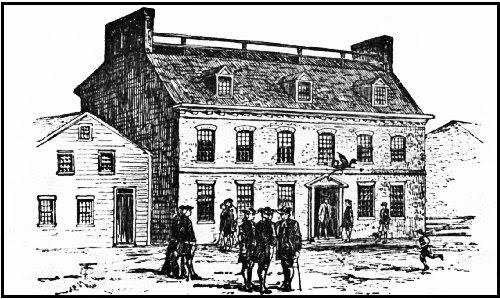 Coffee houses patterned after English & Continental prototypes were established in the colonies, quickly becoming centers of social, political & business interactions. Among the earliest were London Coffee House in Boston, in 1689; the King's Arms in New York in 1696; and Coffee House in Philadelphia in 1700. The name coffee house did not come into use in New England, until late in the 17C. The London Coffee House and the Gutteridge Coffee House were among the first opened in Boston. The latter stood on the north side of State Street, between Exchange and Washington Streets, and was named after Robert Gutteridge, who took out an innkeeper's license in 1691. Twenty-seven years later, his widow, Mary Gutteridge, petitioned the town for a renewal of her late husband's permit to keep a public coffee house.In 1718, Mary Gutteridge became full owner of the Gutteridge Coffee House in colonial British America. As a widow, she petitioned the town of Boston to keep the business license, and it was granted. Boston's British Coffee House,whose named changed during the pre-Revolutionary period, also appeared about the time Gutteridge took out his license. It stood on the site that is now 66 State Street, and became one of the most widely known coffee houses in colonial New England. The Crown Coffee House opened in 1711 and burned down in 1780. There were inns and taverns in existence in Boston long before coffee & coffee houses. Many of these taverns added coffee for patrons who did not care for the stronger spirits. In the last quarter of the 17C, quite a number of taverns and inns sprang up in Boston. Among the most notable were the King's Head(1691), at the corner of Fleet and North Streets; the Indian Queen(1673), on a passageway leading from Washington Street to Hawley Street; theSun(1690-1902), in Faneuil Hall Square; and the Green Dragon, which became one of the most celebrated coffee house & taverns, serving ale, beer, coffee, tea, and more ardent spirits. In the colonies, there was not always a clear distinction between a coffee house and a tavern. The Green Dragon stood on Union Street, in the heart of the town's business center, for 135 years, from 1697 to 1832, and figured in practically all important local and national events during its long career. In the words of Daniel Webster (1782-1852), this famous coffee-house tavern was dubbed the "headquarters of the Revolution." John Adams, James Otis, and Paul Revere met there to discuss securing freedom for the American colonies. The old tavern was a two-storied brick structure with a sharply pitched roof. Over its entrance hung a sign bearing the figure of a green dragon. The Bunch of Grapes, that Francis Holmes presided over as early as 1712, was another hot-bed of politicians. This coffee house became the center of a celebration in 1776, when a delegate from Philadelphia read the Declaration of Independence from the balcony of the inn to the crowd assembled below. In the excitement that followed, the inn was nearly destroyed, when one celebrant built a bonfire too close to its walls. 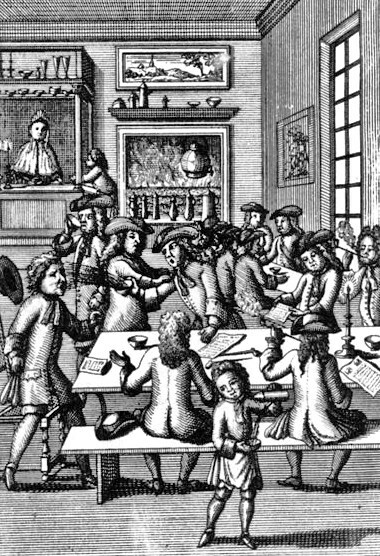 By the beginning of the 18C, the title of coffee house was applied to a number of new establishments in Boston. One of these was the Crown, which was opened in the "first house on Long Wharf" in 1711 by Jonathan Belcher, who later became governor of Massachusetts, and then New Jersey. The first landlord of the Crown was Thomas Selby, who also used it as an auction room. The Crown stood until 1780, when it was destroyed in a fire that swept the Long Wharf. Another early Boston coffee house on State Street was the Royal Exchange. It occupied a two-story building, and was kept in 1711, by Benjamin Johns. This coffee house became the starting place for stage coaches running between Boston and New York, in 1772. In the Columbian Centinel of January 1, 1800, appeared an advertisement in which it was said:"New York and Providence Mail Stage leaves Major Hatches' Royal Exchange Coffee House in State Street every morning at 8 o'clock." In the latter half of the 18C, the North-End coffee house in a 3 storey 1740 brick mansion, stood on the west side of North Street, between Sun Court and Fleet Street. One contemporary noted that it had forty-five windows and was valued at $4,500. During the Revolution, it featured "dinners and suppers—small and retired rooms for small company—oyster suppers in the nicest manner."